Dave Dinkel Real Estate Mentoring Program Reviews - Scam? David Dinkel has a long and storied history in the real estate world, but the first entered into adult life by graduating from the University of Florida in back in 1968. When he graduated from this prestigious university, he earned a bachelor’s degree in engineering. Like Lex Levinrad, he’s also based out of Florida. Initially, when starting out his life in the working world, he first took a job in a petrochemical research and development business that was located in Illinois. But the really interesting part of his career is when he entered into the world of finances. At this point, he decided that the financial sector was his true path and he became a commodity and stock broker with Merrill Lynch during this period of his life. During David’s time as a stockbroker, he decided to also become a certified financial planner at this point in his career, and he even took things a step further and began his own brokerage firms. All in all, Dave Dinkel spent a grand total of 22 years in the financial world as a stockbroker, commodities broker, and certified financial planner. He dominated the financial services industry for over two decades before finally retiring. But Dave Dinkel did not spend his time idly in retirement. On the contrary, he took his love for real estate to the next level during this phase of his life. As David entered the world of real estate investing, he took a job with a small company that he worked for for a few years. During his time in this business, he helped them grow at a tremendous pace and their sales went from a little short of $12 million a year to reaching over $150 million each year. Now granted, this was a brief break from his foray into real estate investing, and he only worked with this company for a short while. After that, David went back into the real estate world with vigor and gusto like you’ve never seen before. As you can imagine, such a successful real estate investor has a long list of accomplishments and accolades. Throughout the years, David has received the following designations or degrees: FINOP, GA, SROP, RR, MRSP, BSChE, ROP, MGA, CFP, RSP, and he’s also a licensed insurance agent, licensed mortgage broker, and a certified estate planner. As you can see, David has taken his knowledge and expertise and used it to become a powerhouse in many industries. If you were ever interested in learning about real estate investing, David Dinkel is the perfect man to teach you the ropes. David first became interested in investing in real estate in 1975, and the real estate investing community gave him the first ever lifetime achievement award. As an active investor, he’s been helping people for the last 40 years and even has a mentoring program for those looking to learn about real estate from an avid professional. He also helps investors’ broker deals without their own money through his transactional funding program. Perhaps he’s most “searched for” for his involvement in mentoring others at how to invest in real estate. 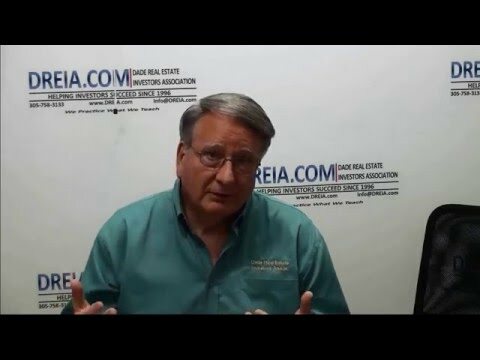 He founded DREIA, the Dade Real Estate Investors Association. Kirk Mullen's life goal is to travel the world while living off investments. He's currently mastering real estate investing, thanks to his never ending thirst for information online. This site is his culmination of opinions gathered on real estate investing courses, guru's, and other mentors he aspires to be like. Is Josh Flagg and His Husband From ‘Million Dollar Listing’ Having Relationship Issues?